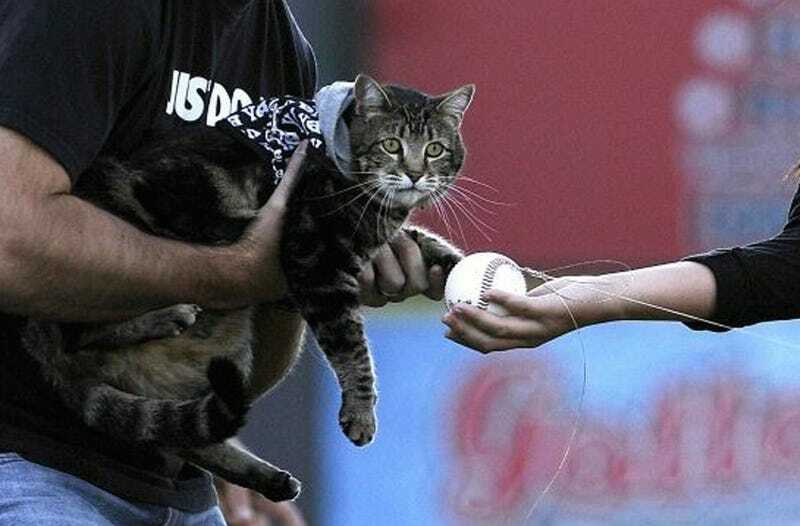 Tara the tabby, who saved her human from an attacking dog, threw out the first pitch at last night's Bakersfield Blaze game. As you might expect, since cats care nothing for pageantry and have useless muppet paws instead of hands, it was one of the worst first pitches in recorded history. #SticktoHeroics. The idea was sound. Tara's owner, Roger Triantafilo, was to sort of shove the cat against the ball, which would be pulled toward home plate by a bit of fishing line. But it didn't work. Then it didn't work again. Or a third time. So Triantafilo just threw the ball himself while holding the cat close to it, and I'd say that qualifies as a cat throwing out a first pitch. I shouldn't make fun. Over the last week, Tara has saved a life and balked in a minor league baseball game. In that same timeframe, my own cat's crowning achievement is puking directly onto my laptop. Congratulations, Tara: You're a credit to diffident furgoblins everywhere.